Are mood and movement essential elements of your poolscape? Whether you’re planning a new pool or considering upgrades to your current one, investments in advanced lighting systems and water features give pool owners new ways to enhance environments, create moods or define spaces in unique and exciting ways. For a moment, consider a pool and its surroundings. A pool’s location, size, shape, relationship to terrain, structures and landscaping are fixed and familiar. Many design elements, and the way we perceive them, are simply visual and static. Can we get other senses involved? The answer is a firm “yes.” Lighting and water features bring mood, movement and sound into the poolscape. Some of these elements, like waterfalls and laminars, require additions or modifications to an existing pool’s plumbing and valves. Others, like some lighting products, are simpler to add or retrofit to a pool environment. 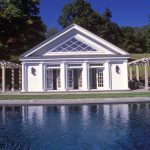 Pool designers and architects can help you integrate these features into a new pool or plan the most appropriate way to execute renovations. Let’s take a look at some innovative lighting and water feature products that add the “WOW” factor to today’s pool environments. Pool lighting can do far more than increase visibility and safety for nighttime use. It has advanced from utilitarian, incandescent white pool lights to thrilling, multicolored LED lights that interface with user-friendly control systems, allowing pool owners to set the mood for any occasion. Today’s lighting systems also allow pool owners to define space and visual emphasis in the areas surrounding the pool to create intrigue and moods that extend deeper into the night. One example is Pentair’s IntelliBrite® 5g Underwater Color-Changing LED Pool and Spa Lights. These energy-efficient lights mix and match individual LEDs to achieve a vibrant spectrum of color that can cycle at varying speeds and in different sequences. These lights can produce five brilliant fixed colors and seven dazzling preprogrammed light shows. Additionally, they can be retrofitted into existing Pentair niches, simplifying installation. For exciting illumination of steps, baja shelves, beach entries and other shallow water features, the same multicolored LED lighting technology is available with GloBrite® Pool and Spa Color LED Lights. Brilliant LED technology is also available for creative illumination of the areas surrounding the pool. IntelliBrite Color-Changing LED Landscape Lights produce the same array of colors and preprogrammed light shows as their underwater counterparts. When integrated properly into an overall pool environment, lighting products like these can create sweeping visual landscapes or isolated, tranquil vignettes at the whim of the user. All IntelliBrite and GloBrite lighting systems can be integrated with one another for synchronized light shows that can be controlled through Pentair’s IntelliTouch® or EasyTouch® Control Systems. 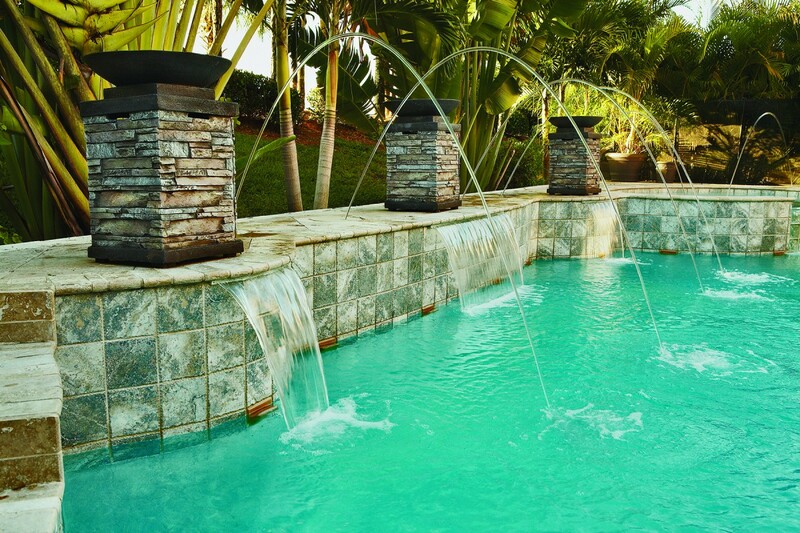 Pentair recently introduced a visually stunning poolscape feature that combines motion, light and soothing sound. 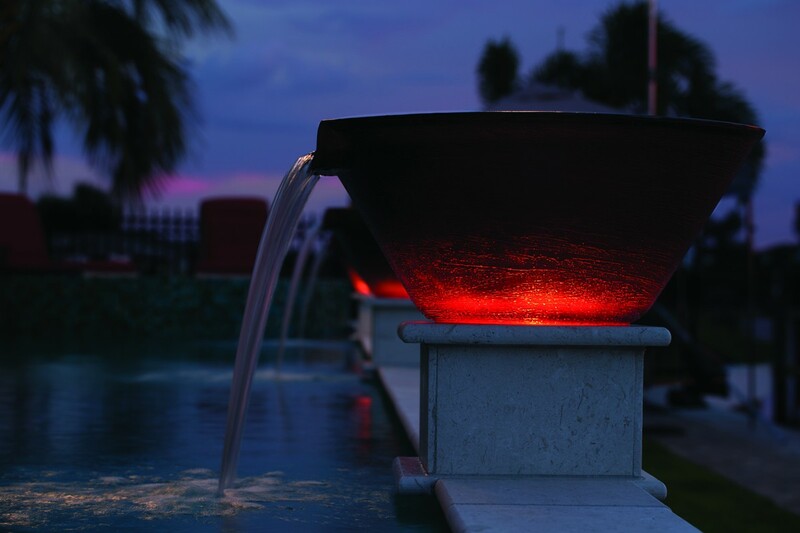 The MagicBowl™ Water Effects with FireFX™ LED Lights (sold separately) is the only water fountain bowl with elegant, lighted fire effects. By day, it can be appreciated as an architectural element. By night, the safe and energy-efficient LED lights combine with the flowing water to flicker and dance like an actual glowing fire, creating a truly enticing experience. MagicBowl is an example of a poolscape feature that’s ideally suited for new pool and remodeling installations. Waterfalls add the sight and sound of moving water to enhance environments, imbue tranquility and mask background noise. Some contemporary designs for larger, more elaborate pools include very large rock waterfalls that are a primary feature of the overall design. Many other more modest waterfall designs are also available, such as MagicFalls® Water Effects from Pentair. These waterfall effects are available in sheet, curtain and rainfall or arc sheet and rainfall effects in widths from eight inches to eight feet—and come in many shapes and finishes. Smaller water features like laminars and decorative accents add appeal, especially when incorporating lighting. One popular water effect made by Pentair is the MagicStream® Laminar. This effect creates totally clear, uniform arcs of moving water that originate from either the pool deck or surrounding landscape. At night, these translucent streams are brilliantly colored with an LED light source. The result is a water effect that adds an elegant bit of entertainment that’s especially endearing to kids. Almost all of the lighting and water feature effects described here can be controlled with advanced automation systems that allow pool owners to set the ideal mood for the moment. Pentair’s IntelliTouch or EasyTouch control systems make the operation of lighting, waterfalls and other water features blissfully automatic and simple. And, there are many ways to control these systems remotely via mobile devices, tablets and wireless remotes. With the optional ScreenLogic2® Interface, pool owners get even more options for remote control. This interface allows the use of controllers such as an iPad®, iPhone®, iPod touch® mobile digital device, Apple Watch® wrist wearable device, Android® device, PC or Mac® computers, Amazon Echo™, Amazon Fire™ TV, Amazon Echo Dot™ and Amazon Tap™. Ready to take the next step toward a more colorful and vibrant backyard environment? This article covers just a few of the exciting innovations available to add mood and intrigue. See your pool professional for a more detailed look at what’s right for your particular backyard paradise. Apple Watch®, iPhone®, iPad®, iPad touch® and Mac® are registered trademarks of Apple, Inc. in the United States and/or other countries. Amazon Echo™, Amazon Fire™, Amazon Echo Dot™, and Amazon Tap™ are trademarks of Amazon Technologies, Inc.